Recorded Live at Air Canada Centre, Toronto, ON, Canada - June 11, 2003. Excellent Audience Recording :: CDRs :: Lossless FLAC. Files: 28. :: Size: 1.08 GB (flac). Personnel: Ozzy Osbourne :: Jason Newsted :: Mike Bordin :: Zakk Wylde. Notes: Recorded live at the Air Canada Centre in Toronto, Canada on June 11, 2003. This is one of the best live audience recordings of Ozzy I've heard to date. Everything is captured from the intro music to the outro music and nothing is cut, so the full show is here in all it's glory. 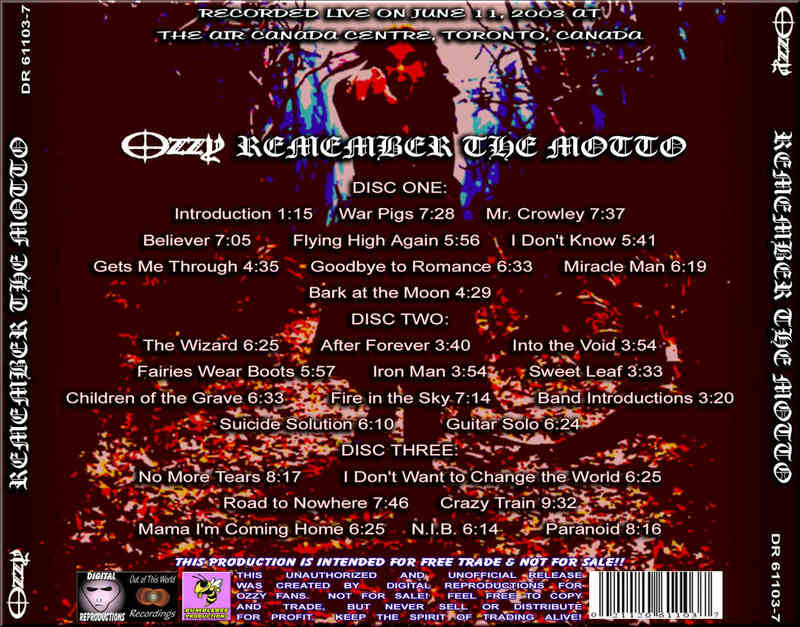 And a full show it is, Ozzy plays for 167 minutes on this night! The set list is full of Ozzy classics and a great collection of Sabbath tunes including the very rarely performed "Fire in the Sky". He almost plays the whole "Master of Reality" album, my personal favorite. Ozzy is in great form tonight, which surprised me a bit given the few times I've seen him on MTV lately. He is definitely a different individual live than he is on TV with his screwball family. There are a couple occasions where he seems to mumble through some of the lyrics, but nothing severe. Jason Newstead performs double duty tonight playing in the opening act, VoiVod, and in Ozzy's band. He does a very good job and you don't notice any problmes except for parts of "No More Tears" where it sounds on the verge of a train wreck. 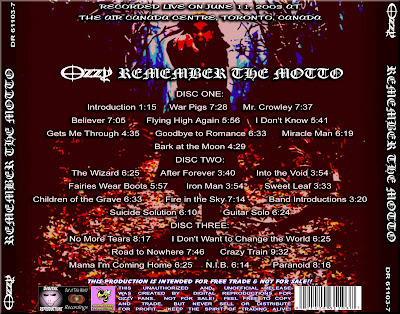 All in all this is highly recommended to any Ozzy fan as the sound is superb. All the instruments are well resolved and loud, sound quality is EX+/EX. Once again many thanks to Barb and Mark for lending their mini-disc masters to this release. Each recording they do is better than the one before it, and we're the beneficiaries.<-(Info taken from original info file).